A blogging version of Where’s Wally? 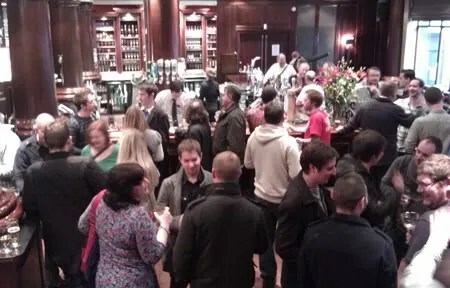 Beer bloggers tend to be a friendly bunch – and by and large get on well with each other (unless someone mentions sparklers, CAMRA, cask v keg, ‘black’ IPA’s, or the Oxford Companion to Beer). As such, each year a large group descend on a beery city and attempt to deplete it of every beer over 6% within a few hours. Last weekend, the latest Twitter-led pissup (Twissup) took place in Newcastle, and the BeerCast made the 90min journey southwards from Edinburgh for the day. Being a 10am train connecting Scotland and Newcastle, everyone apart from the conductor and ourselves was already drinking – from the lads with the crate of Stella to the young girls downing pink champagne (“Totally – she was proper tonguing him!”). Saving ourselves for the beery delights, we prepped the moleskine notebook and waited for 11:30 – arriving at Bacchus on High Bridge. What an amazing place – forget about the ocean liner décor for a moment (see photo above) – the beer selection was astonishing. What’s a good late-morning tipple? The 9% Highland Old Norway? 7% Nøgne Ø Porter? 7.4% Black Isle Black Stout? 6% Summer Wine Diablo? Clearly, the chaps at Bacchus knew we were coming. After a couple of warmup beers – including the bespoke house beer from Yorkshire Dales Brewery – Bacchus vs Zeus (3.7%), it was time to catch up with the fellow beer writers, brewers and lucky partners who had made it to the event. That done, and a few names/faces sorted out, it was off to a brewery for a visit. Tyne Bank started production only six months ago, having been founded by ex-chemical industry worker Julia Austin. Along with head brewer Mark McGarry, they gave us an interesting talk on the formation of Tyne Bank, and their philosophy of production. We also got to try a number of their beers – such as the lovely 5.2% Cherry Oatmeal Stout – the oatmeal really brings the cherry in line nicely. The Monument Bitter was also excellent. Tour complete, and Julia kindly pointed us in the direction of the Cumberland Arms “You have to go through a bit of a sketchy area, but it’s daylight so you’ll be fine”. What a fantastic place (the pub, not the neighbourhood). An end-row alehouse with the houses having been demolished, it’s like a real-ale island. Gravity dispense, wooden interior, huge range of beer and cider, and a tremendous spicy chicken ciabatta. Even outdoor seating (although it got extremely parky – even for visitors from Scotland). From the Cumberland, we wandered off and ended up in another great pub – the Free Trade Inn. Firstly, the view along the Tyne was really something. The beers, too, were just as good. Highlights included two from Summer Wine – the marmaladey Covenant and deep roasty Cohort. The amiable Dave Bailey was floating about, so we got an impromptu ‘behind the beer’ story of Hardknott Vitesse Noir – a wonderful 11% vanilla and coffee infused imperial stout. Also, a mention of Panda & Frog Pandazilla (7%) – produced at the Mordue Brewery as a side project by blogger and assistant brewer Rob. A Cascadian Dark Ale (although we didn’t know that at the time), it was creamy, with plenty of coffee and banana, and big walloping booze hit at the end. Love the pump clip, too. By this time, the Twissup had fragmented a bit, as others went to the Cumberland for food – so we hot-footed in back into town along the river. Everyone in the UK knows the reputation of Newcastle for being a party town – high heels and coat-free hedonism, whatever the weather. Having never been on a night out there before, I can safely say this is a colossal understatement. I’ve never been anywhere on Earth with a higher concentration of pubs, bars and clubs. It seemed like the whole of England was there, tottering about in their best shoes, or shirts, or both. Drink is the currency in Newcastle. Drink. A quick trip to the Newcastle Arms – found everyone about to leave again, for somewhere else (but we also found Thornbridge Crux – can they do no wrong?). So us hardy Scots ended up back in Bacchus, piling through the big hitters. At 8pm, beers that seem too much at 11am go down a treat – witness the Old Norway, and Nøgne Ø Porter. Cracking stuff. Home on a deserted train, rejuvenated by the warmth of a Burger King takeout, another Twissup complete. Nineteen new beers in the book, as well – although, clearly, I am not a ticker. Many thanks to Andy and Mark for sorting out the twissup, not to mention the local bloggers for taking the group under their Geordie wings. Big thanks also to Julia and Mark at Tyne Bank, and to all of the pubs we ended up in during the day. Where next, for Twissup’12? its pandazilla, not panda killer! http://robsbeerquest.blogspot.com/2011/11/panda-frog-brewery-announcement.html great writeup, i wondered what order everyone went to the different pubs in. Saturday was a cracking day, pleased we had such good weather to show off the toon to first time visitors. The Tyne Bank Brown was class, like prunes!